Confident in both your mobility and defense, you bring terror to the battlefield when you are protected by the Kaspar Blackened Tassets. Handcrafted from high-quality steel, the layered plates of each tasset move with your movements. 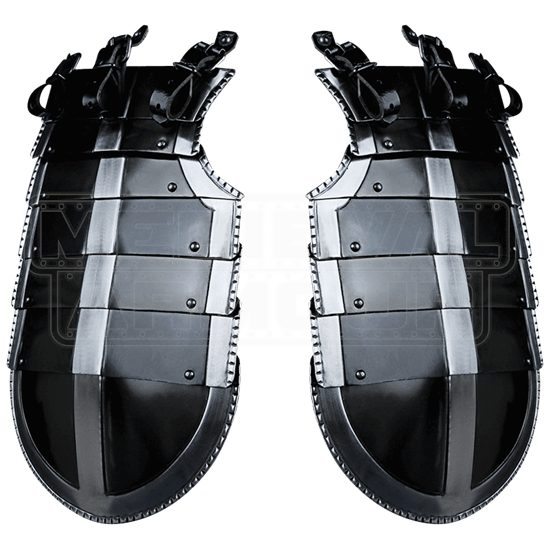 Sold as a pair, each tasset features seven plates layered together in such a way that allows them to defend your upper legs without excessively hindering movement. These Renaissance tassets are inspired by the armour worn by 16th and 17th century mounted soldiers. Electrochemical treating grants each tasset its distinct look along with rust resistance, blackening the middle of each panel while leaving a central stripe and wide border of brightness for eye-catching contrast. Adjustable leather straps along the top of each steel tasset help you attach them to a cuirass or chest plate, such as the Kaspar Blackened Cuirass, and achieve a comprehensive armour ensemble. Suitable for LARP and costume use, fallen knights and wicked warriors hailing from medieval history and fantasy are sure to enjoy the protection, flexibility, and style of the Kaspar Blackened Tassets.